Chone has the pink eye! I guess since she's my kid, she would have jacked eye ever once and a while. We noticed it yesterday afternoon and it kept getting worse and worse. I put breastmilk on it (ever hear that one?) and it made more of the eye crap come out. Her left eye got a little swollen, so I took her to urgent care today. I asked the Dr. if they prescribed drops for infants if the babies get it, and she told me that for babies you can put breastmilk on it! I was surprised the Dr. recommended that, but she also said if they got it I should at least call the Dr. 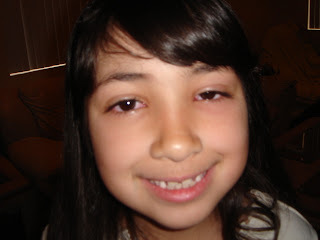 They prescribed Chone the eye drops and she can't go to school tomorrow. It's her 1/2 birthday today (7 1/2)! She was going to celebrate her birthday at school tomorrow. (The teacher celebrates the summer birthdays on their 1/2 birthday.) So now I guess she has to wait until Tuesday.